Nearly everyone has been stung by an insect or at one time or another. It is an unpleasant experience that people hope not to repeat, but for most people, the damage inflicted is temporary pain. 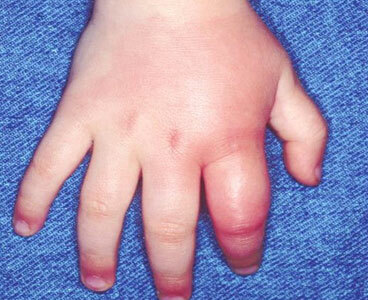 Only one or two people in every 1,000 are allergic or hypersensitive to a bee or wasp stings. The information that follows pertains to stings from fire ants as well. Stinging insects are limited to the order Hymenoptera, which includes wasps, bees and ants. The stinger is a modified egg-laying apparatus, thereby granting the stinging power to only females. Most hymenopterans live solitary lives, with their behaviour more likely to be a flight than fight. Social hymenopterans, including yellow jackets, bumble bees, honey bees and fire ants, have individuals in the colony whose task it is to vigorously defend the nest. In addition, foraging members of the colony will also sting if they are disturbed or injured as they go about their activities. Some types, such as the yellow jackets, are much more liable to attack than are others. Stingers are effective weapons because they deliver venom that causes pain when injected into the skin. 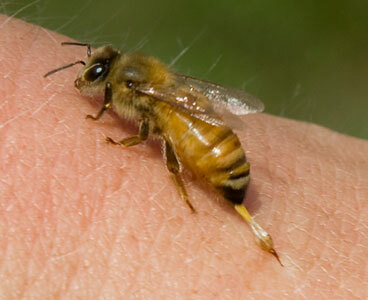 The major chemical responsible for the pain of a honey bee sting is called melittin. It induces pain by stimulating the nerve endings of pain receptors in the skin. The result is a very painful sensation, starting as sharp pain that lasts a few minutes and dwindling to a dull ache. Tissue around the affected area can still be sensitive a few days later. The body responds to stings by liberating fluid from the blood to flush venom components from the area. This causes redness and swelling at the sting site. Unless this is the first time that the person has been stung by that particular species of insect, it is likely that the immune system will recognize the venom and enhance the ‘flooding’ procedure. This can lead to very large swelling around the sting site or in a whole portion of the body and leave it quite itchy. Try not to rub or scratch the sting site because microbes from the surface of the skin could be introduced into the wound and could result in an infection. When the sting is caused by a honeybee the stinger usually becomes barbed in the skin and remains there once the insect leaves. Remove the stinger as quickly as possible. Venom continues to pump from the stinger for 45-60 seconds following a sting. After being stung, your wound may still be throbbing. You’ll want to relieve the pain as quickly as possible. The following substances have proven themselves effective, but you must act quickly after being stung for them to work. COLD – An ice pack, or even just an ice cube, placed over the sting can cut down on swelling and keep the venom from spreading. HEAT - Ironically, heat can also make you feel better by neutralizing one of the chemicals that causes inflammation. Just take a hair dryer and aim it at your sting or run it under hot water. AMMONIA - Sometimes dabbing household ammonia on the sting does the trick. If it’s going to work, it will relieve the pain very promptly. BAKING SODA – Apply a paste of baking soda and water. MUD - If you don’t have anything else handy, you can use a trick that has been around for thousands of years. Misc a little clay soil and water into a mud paste. Apply and cover with a bandage or handkerchief. Leave this muddy cast on until the mud dries. The number one solution is a slice of fresh cut onion held on the bite site. I would also recommend garlic for stings. Not sure the facts behind it but it seems to neutralize the venom. Have tried it personally many times. I have garlic in my fist aid kit.